Excelerated Oil has been proven to increase gas mileage by 10%, 15% even 20% or higher. In addition it can extend engine life by 100,000-200,000 miles or more. Our oil has been proven to last 15,000, 20,000 or more between oil changes thus reducing the frequency of your oil changes by 600-700% and saving you time and money. From the individiual with one or two cars, a small business with several vans, to the large company with 250 vehicles, every customer is equally important to us. 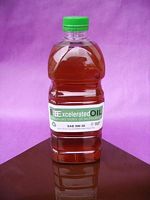 "We believe that Excelerated Motor Oil offers more advantages than any other product on the market today. One of the huge benefits we offer is that we are a "Mobile Oil Change Service" we come to you. Its applications will benefit everyone from commercial companies to the individual paying the rising gas prices in today’s unstable economy. It is a proven product with measurable results."